So why the crash course on CLUE Reports? The North Carolina Association of Realtor’s Offer To Purchase and Contract states on page four (4) in Section 4 (b) (iii) under the title BUYER’S DUE DILIGENCE/Property Investigation/INSURANCE ‘Investigation of the availability and cost of insurance for the Property‘ is a requirement of the buyer which as you may have guessed may have significant impact on a purchasers ability to obtain a mortgage. New mortgage lending rules such as the Ability to Pay Rule and the Qualified Mortgage Rule which were enacted by Congress in 2010 and kicked in in January of 2014 and impact nearly ALL Mortgage loans. If insurance costs are not properly vetted before hand could it cause you not to be able to qualify for the mortgage on your dream home and could cost you thousands in lost fees and deposits. Most of us are familiar with CarFax. We see the commercials all the time with the Fox puppet following the prospective car buyer around warning the buyer not to purchase the car before purchasing a detailed report on the vehicle. Believe it or not, there is a similar system that insurance carriers use for buildings, homes and the people that insure them. A Comprehensive Loss Underwriting Exchange, or CLUE Report, will track up to a seven (7) year claims history for a property and property owner. As you can imagine, a CLUE Report with multiple claims may cause issues if you are trying to buy, sell, or insure a property. Most people are unaware of CLUE Reports and how they affect property ownership and protection. CLUE Reports include not only accepted claims, but denied claims and inquiries. They are meant to be a comprehensive record of all loss history on you as an individual and on a property. Regardless of payment to a claimant; whether or not you file or don’t ultimately file the claim; or whether it is denied or accepted; a call to an insurance company will most likely end up on a property CLUE report which can significantly impact the cost to insure that home. 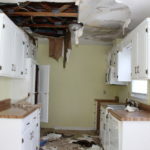 Two things every homeowner needs to consider before filing an insurance claim. ← When Should I File a Home-Owners Insurance Claim?